Welcome back to Fountain Pen 101. Before I really dive into the meat of this series, I want to cover the basic anatomy of a fountain pen. I’m just going to cover the parts I’ll be discussing later. If you want an in-depth look at all of the parts, I suggest you check out this post on the Goulet Pen Co. blog. Cap: This one’s easy. Most pens have a cap. Those that do, it’s important to keep them capped when not in use, so the nib doesn’t dry out. Some people like to post the cap when using their pen (like in the photo below), but not all pens are postable. It depends on the body. Body/Barrel: Another easy one. The “official” term is barrel, but I doubt anyone would be confused if you call it the body. If you’re using a cartridge or converter pen, this is the part you unscrew to get to said cartridge or converter. Depending on the shaping of the body (if it’s tapered or not) you may or may not be able to post the cap. Grip: This is where you hold the pen. A grip can be completely cylindrical, it can feature a flange right at the end to help keep your fingers from getting inky, or there can be indentations to keep your fingers properly placed. Jim was kind enough to draw up this schematic illustration of a fountain pen for me. You can find him on Instagram as PenSloth. Nib: The nib is what actually writes. Most people are familiar with the shape of a nib, even if they don’t know what it is. It’s often used as the icon for pen tools in computer programs. 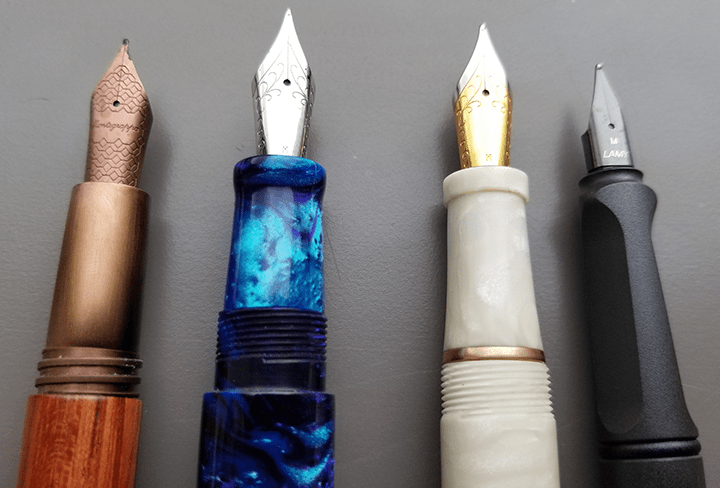 There’s so much to know about nibs, that I’ve decided to add a separate post just about them. Feed: The feed is what delivers ink to the nib. If your pen gets clogged, it’s likely because of the feed. Shimmer inks, especially, can clog up the channel on the feed. Section: Depending on the pen, there may be a section, which is what houses the nib and feed. It typically screws into the grip. Converter: Fountain pens all have some sort of ink reservoir. Some are built into the pen, but others take cartridges (pre-filled, disposable tubes of ink) and/or converters (empty, reusable tubes to hold ink). JetPens has a great article about using converters.